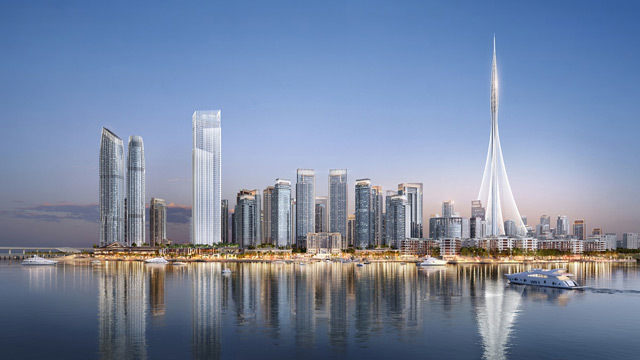 Construction of the world’s next tallest tower in Dubai has reached a new milestone and is running ahead of schedule. The 450 skilled workers commissioned for the $1 billion (Dh3.6 billion) project have just completed the concrete placement for the pile cap of the super-tall masterpiece, it was announced on Tuesday. The pile cap is an important component of the mega structure. It is so massive that the amount of concrete used to put it in place is equivalent to the weight of the CN Tower in Canada. The tower is the centrepiece of the Dubai Creek Harbour, a waterfront development located on the banks of Dubai Creek featuring mixed-use towers. It is scheduled for completition in 2020. The pile cap is an approximately 20-metre multi-layered, tiered reinforced concrete top that covers and transfers the load to the foundation barrettes. In October 2016, His Highness Shaikh Mohammad bin Rashid marked the ground-breaking of the tower, with the foundation work accomplished in a record time. As of May 2017, barrette piles have been laid to depths of over 72 metres, approximately a fifth of the height of one of the five tallest towers in Dubai, to secure the structure. The barrette piles used for the foundation have been tested to a world record test load of 36,000 tonnes. The tower is envisioned to become the next global icon. The design of the structure was done by Spanish/Swiss architect and engineer Santiago Calatrava Valls.